Well, I am now in my second semester at Erskine so I must have a pretty good grip on college life, right? I make decent grades. I know how, when, and where to study. I have that stable friend group. I can handle anything that Erskine throws at me. HA. That’s laughable. In the past seven months that I’ve been at Erskine, I may have learned how to thoroughly analyze Brownings’ “My Last Duchess,” participate in a handbell choir, and even carry a decent conversation in Spanish, but I still don’t know squat. Honestly, the more I learn about something, the more I realize how little I actually know. The only reasons that my ignorance doesn’t totally frustrate me are the reality that I don’t need to know everything and the faith that I have in Erskine’s ability to prepare me for entering “the real world” by the time I graduate. After I graduate, I want to head off to graduate school and pursue an M.S. in genetic counseling. For those of you who aren’t familiar with the term, genetic counseling is the practice of giving advice to families who are worried about the nature, risks, consequences, or treatment of a genetic disorder. My passion for genetic counseling was sparked when I visited a genetic center in Greenwood. During that visit, I toured through various labs and talked to several employees, but was uninterested in any subjects until I talked to the genetic counselor. Genetic counseling may sound like the most boring job on earth to you, but several aspects of the job appeal to me. As a Christian, I love the counseling part of the job. God has endowed me with a desire to get to know people and to bring out the best in them that I can. I love listening to people’s stories and learning their interests, fears, and opinions. I have always wanted a job that centers itself on helping others. A part of me loves working with people because I want to fix them, which is a desire that can be taken too far if God is shoved out of the picture. While I know that I cannot cure people’s hearts, minds, or bodies, I am secure in the knowledge that God will use me to serve Him in amazing ways. As a science-lover, I really enjoy learning about genetics and how someone became the person that they currently are. I am a short, squinty, asthmatic Asian and that’s all due to genes (thanks, Mom and Dad..). I am the kind of person who needs to have a plan if I want to be able to move forward. Becoming a genetic counselor may not be in God’s plan for me and I am open to change, but right now in my life, I have a goal to work towards. Part of the reason that I came to Erskine is because I expect to graduate from Erskine feeling ready to take on whatever challenges come before me. I fully believe that Erskine will supply me with the knowledge that I will need to succeed in graduate school, the faith that I will need endure trials in the world, and other important life skills. What do you expect from a college? Here’s a little secret about me: I used to hate Erskine and I would have rather licked a hobo’s foot than attend the college. AHHHHH. TRUTH BUBBLE. But there it is. I can never un-confess it. Before I get attacked for posting this on the Erskine student blog, let me try to explain myself. I’m guessing that a few questions are coming to mind. How could I ever hate Erskine? Why am I now at Erskine? Do I ever regret going to Erskine? What could have happened to change my mind? Honestly, I can only say that God changed my mind, just as he changed my heart. I used to want to go to a different Christian college. That college had been my dream school for years; but as I visited people and classes there, I began to realize that I didn’t enjoy being there. For the sake of being polite, I won’t name the college, but I do want to say that it is a great college and I’m not trying to bash it. It just wasn’t the college for me. 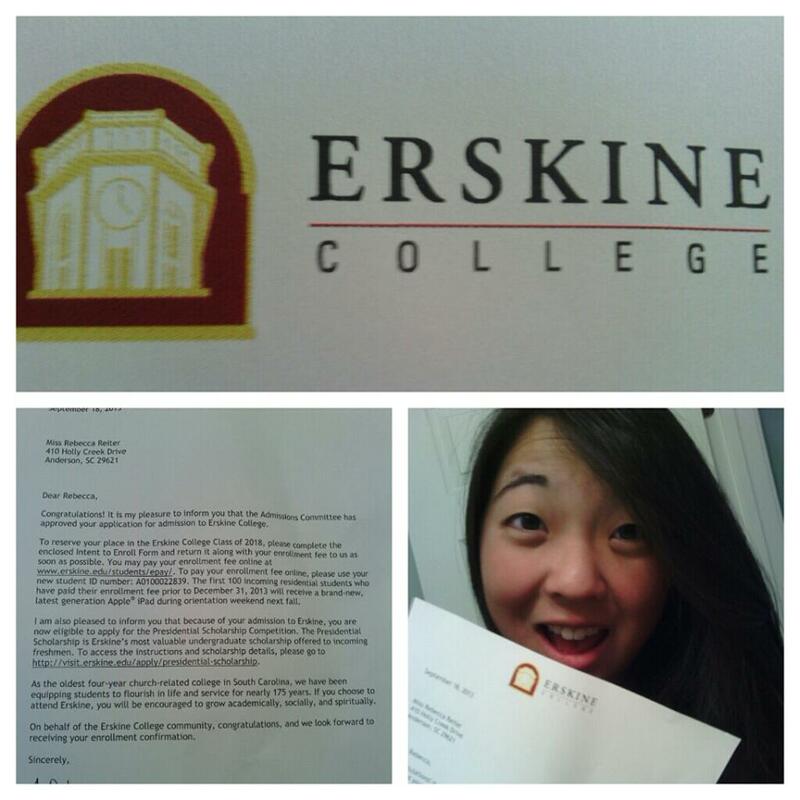 While I was still considering that college, I decided to apply to Erskine as a backup, in case I wasn’t able to go to any other college ever. Once I was accepted at Erskine, I decided to apply for the Presidential Scholarship. The fall of my senior year really opened my heart to choosing Erskine. My experience at the Semi-Finals helped me to envision spending four years of my life at Erskine and growing both mentally and spiritually there. I enrolled at Erskine in December and I got a free Ipad because I enrolled so early. This change of heart seems sudden, so now that I’m at Erskine, do I regret my decision? Has Erskine let me down? I’m gonna be honest: it really hasn’t. Sure, there have been times when I’ve been discouraged, stressed, lonely, etc. But those times are bound to happen at any school and there are so many good things about Erskine that outweigh the good. Studying is definitely not my favorite thing to do on Friday nights, but some of my favorite memories so far have been the times that my friends and I have goofed off while studying together. Also, I have absolutely loved living only thirty minutes away. This past weekend I was able to attend my high school’s homecoming football game and catch up with some old friends. I think that Erskine is a good place for me, because I can be as far away from my old life as I want. If I don’t want to see my parents on weekends, I totally don’t have to! But if I ever feel like eating a home-cooked meal and bumming some gas money off my ever-gracious daddy, then home is only a short drive away! I thought that I would avoid my daddy like the plague once I moved to Erskine, but I’ve visited his office at 11:00 every Monday, Wednesday, and Friday morning (I’m such a daddy’s girl). My main point is just this: if you’re reading this while trying to pick a college, don’t rule out the one that’s right under your nose until you’ve visited and experienced the culture and environment. Don’t judge a college just by hearing about it from a friend. You may miss out on a college that is absolutely perfect for you. It may be Erskine; it may not be Erskine. All I know is that I got a pretty sweet deal by coming here and I can’t believe that I fought against it for such a long time. All right, you’ll have to bear with me for this one a little bit, because I am about to get a little sentimental. Jordan and I as high school seniors after the musical, "Once Upon a Mattress." Yesterday evening I drove just over an hour to the Greenville area to see one of my best friends from high school in her senior recital, and it was probably one of the most distinctly “senior” experiences that I have had so far. Jordan was, as we always say, my “right ear” during high school – we started the first day of freshman year sitting next to each other in the alto section of last period chorus, and we have been friends ever since. We both auditioned and got into show choir the next year, we did the musicals every year, auditioned for All-State Choir together. . . you get the idea. Even when we went away to different colleges, we both ended up with one of our majors with music (though she turned into soprano to the surprise of both of us!). I have gotten to see her a couple of times these past four years, visiting Furman once for a concert and once for their production of “Sweeney Todd”, and we even had a chance encounter in Madrid (yes, in Spain) in the middle of a crosswalk. . . but that is an interesting story for another time. The point is that we kept up with each other, even if not consistently, and we both continued to surrounded ourselves with music and theatre. A year and a half ago we ran into each other in Madrid. . . providence. Finally, in the past month, she managed to find Due West to see my senior recital, and I returned the favor to see her last night. I think both of us were a little shocked at how much we had changed since the last time we heard our little high school selves sing – I know that I was, and this made me think about how much I have changed. It’s amazing how much four years, especially in the important years of early adulthood, can affect someone. I thoroughly enjoyed hearing her sing, seeing her and her family again, and reminiscing on how much we have matured. It’s hard to believe that so much time has passed since we met eight years ago, or even since we last sang together. I also began to realize more fully that I don’t know where we’ll both be even in two years, just as with my classmates at Erskine. There is so much uncertain about the end of college, even if you know where you are headed next, as I do. There are so many friends and classmates who will be dispersing, moving on to other colleges, getting jobs, moving all over the place. . . and we will never all be here again, in tiny, quirky little Erskine, taking classes and living together. It’s funny what makes the strongest impression in periods of transition, because these are often not what you expect them to be. However, I have confidence that since Jordan and I have stayed friends through these four years, we can maintain our friendship for the next four, no matter where we go, and I think that I will be able to manage this with friends at Erskine as well. ly give a fair chance after all. Whew! And spring semester is off to a running start, as always. . .
One of the most difficult things about this time is figuring out that new schedule, which is a much more challenging task than it seems like at first. Especially as a college student, life is so much more than classes, and it’s often such a challenge to fit everything in that you want to do. Where do you draw the line between academics and diversion? Or extracurricular commitments and free time? Or time with friends and time with God? Or even basic living necessities like fitting in time to do laundry (says the girl who just ran away to check the load in the dryer)? It’s certainly a lot to balance, let me tell you. Something that I have definitely learned over the first two years of my time here is the value of being able to say NO – such a basic skill that all of us overachievers have a hard time with sometimes. For such a small college, Erskine sure has a lot going on! For example, this weekend, just the first of the new semester, there were already so many things going on that I had to forgo the big Super Bowl parties to finish my homework this evening. However, I got to see a musical at a local college on Friday night, went dancing Saturday night, attended a new church this morning, and even squeezed in an hour of ballroom dancing club this afternoon! I think that makes a pretty good weekend, and my small sacrifice of not watching the big game was worth it. In addition to just balance of school-type activities, one thing I am determined to do this semester is to make sure that I leave time for the important people in my life. As I think I mentioned earlier, one thing that really left an impression on me in Spain was how much importance they place on family and friends there, and now that I’m back I intend to maintain and grow my relationships, as well as form some new ones. And of course, there is the most important person in my life – my Lord. Bringing back a stronger relationship with Him is something that I must make my priority, because I know that He has to be the center of everything I do. This is something that I, like most college students, really struggle with; it’s so easy to get caught up in everything going on that you just kind of push Him down the list. I realize that the more I do this, though, the more difficult everything else in life becomes (go figure, right? ), so instead of putting things like church and a little prayer on my list of time commitments, I am going to try this thing where I keep Him with me as I do everything. It’s just a crazy idea that I had, that I have heard many times, and I somehow think it just might work. Let’s hope that I can keep this going! So bring it on, spring semester – bring it on, because I’m bringing my God with me this time.